Camp Defibrillator Committee would like to thank everyone who helped to make the Sunday coffee morning such a great success. There was a raffle and name the CPR manikin competition (winning name is Maurice). Some beautiful prints were generously donated by George McClelland and auctioned by John Chambers and there was a demonstration of the new equipment in which many took part. Thanks to all those who brought goods along as well as contributing on the day and many thanks to Joe O’Dwyer for the voucher and advertising. We raised a fantastic €726 on the day and we would like to thank Camp Community for its generous response and support. The organisers, Noirin Deane and Caroline Hayes wish to thank everyone who took part on the night and all who supported through sponsorship. Thanks also to Sean Barry and Pat Moore and all the staff at the Junction Bar. 850 euro was raised for the oncology unit at Kerry General Hospital. Congratulations to Maureen O Connor, Newbridge, Co. Kildare and Camp and Michael O Connell, Kildare who were married on Friday last in Kildare and held their wedding reception in the Lumville House Hotel, The Curragh, Co. Kildare. Family and friends enjoyed a wonderful day out with Maureen and Michael on their Special Day . Good luck to them both and may they enjoy a long and happy life together ! Changes in Ministry for the Corca Dhuibhne Pastoral Area Following the recent Diocesan changes by Bishop Bill Murphy, the four parishes of Corca Dhuibhne Pastoral Area (Annascaul, Baile an Fheirtéaraigh, Castlegregory & Dingle – Total Population c.9,000) are being served by four diocesan priests in full-time ministry. In line with Diocesan Policy, the following revised Mass Schedule for weekends is to be introduced with effect from the weekend of July 28th/29th 2012. This schedule ensures that each church community will have a Weekend & Holy Day Mass. The new schedule involves the reduction from 17 to 12 Masses each weekend. Work evenings, Monday nights, get together at 7.30 p.m. at O Dwyers Retail Centre, Camp. Everybody welcome. Noreen Ashe Finn, Lougher, Annascaul will launch her new CD on 12th. October in The Ballygarry House Hotel. Noreen is featured on UTUBE with “Just Loving You”, a beautiful singer and accomplished musician, she will do well ! Noreen plays in different venues around West and Mid Kerry. She comes from a family of traditional musicians and singers, her brother Johnny Ashe, Keel, Castlemaine has already established himself in the local and national music scene and Noreen’s late father, Dan Ashe R.I.P. was an accomplished accordeon player and a wonderful polka set dancer. Wishing Noreen the very best of luck and success with her CD and do put 12th. October in your diary. Included in the lineout of support musicians on 12th. October are Johnny Ashes, Declan Nerney and many more ! The following websites are helpful resources to learn more about our County, our Country, and Europe. I’ve found them very useful in learning about current issues, navigating government agencies, and educating oneself about how government works. I hope you find them useful too. Organiser of the event Bawnies brother, Chris O Driscoll, Bawnies brother will perform a skydive later and all funds raised will go towards Acquired Brain Injury Ireland. On Saturday almost E4,000 was raised and donations are still coming in. Chris wishes to thank everybody who attended, contributed on the day and also thanks to those who could not attend but made donations and all who helped on the day. Well done to Chris !! Acquired Brain Injury Ireland provides a support service for young people. Donations can also be made online to www.skydive4charity.ie. Acquired Brain Injury Ireland is Ireland’s leading provider of flexible and tailor-made services for people with an Acquired Brain Injury (ABI). Camp Defibrillator Committee would like the community know what their money was spent on since they began fund raising in 2009. Thanks to the generosity of the Camp Community a total of €14,528 was raised. Training sessions cost €4,087 in total, 57 Camp residents are now fully trained, many of whom attended the refresher courses. Replacement batteries and pads and new training equipment have cost approx €1,475, which is a total of €13,162. This leaves €1,366 in the Defibrillator Fund to date. The new equipment is a trainer defibrillator and a chest dummy for people to practice their chest compressions in CPR. This equipment will be loaned out to any Camp community group for practice training as long as an adult will take responsibility to take care of the equipment. To facilitate ongoing CPR and defibrillator training and the maintenance of equipment, there will be a coffee morning and raffle after the 10.30 am Mass on Sunday 22nd July 2012. Come along and see the new equipment in action, take part in a raffle for a lovely hamper and a “name the CPR dummy” competition (all proceeds to the defibrillator fund). Your support will be much appreciated. TABLE QUIZ: Quiz in aid of the Oncology Unit at Kerry General Hospital will be held in The Junction Bar, Camp on Friday July 13th @ 9pm. €20 per table of 4. Spot prizes and raffle and questions coutesy of Sean Barry. A great night guaranteed. Your support is greatly appreciated. Organisers – Noirin Deane and Caroline Hayes. FUN SUMMER CAMP: Cost €50. These camps will be an enjoyable experience for children and will offer great value for money in a safe and fully supervised environment. 066 7130338: 0879558190 or e-mail: campchildcare@eircom.net. JOB VACANCY: A job vacancy exists in the Afterschool section of Camp Community Childcare Centre. For more information Please Contact the Centre Manager, Carol McCormack – 066/7130338. Swimming classes in Ballyheigue, July 16 -20 register at 10.30 a. m. near lifeguard station . Water safety course at Meenogahane Pier Causeway July 23 -28 . Contact 066 7131327 ,087 7730320 . 10.00 per hour every Tuesday 2.00 – 3.00 pm in Blennerville all ages welcome. Also Dance Classes in all styles all summer contact 086-3451900 if interested. Thank you. Frankie Mulcahy, well known accordeonist of “Riverdance” fame will play in Ashes Bar on most Sunday evenings between 6 – 8 p.m. up until the end of September. Gleann-na-nGealt is called the Valley of the Mad, because of a belief that a cure for insanity exists in a well which is situated in the valley. Legend has it that the name is associated with Gall, who was king of Ulster and was cured of madness when he drank from the well and eat the watercress growing in its waters. Ancient history also tells of “Bolcan” King of France who was also restored to full health when he drank from the well fleeing from the battle of Ventry harbour. In the 12th. century tale of “An Bhuile Shuibhne”, Gleann-na-nGealt is said to be the place where Mad Sweeney found peace when he was banished to wander Ireland for a year and a day. Mad Sweeney was one of the early kings of Munster and recent historians link him with King Arthurs Merlin the Magician. A book called “On The Trail of Merlin” published some years ago tells of Merlins wanderings throughout the British Isles and includes details of his stay in Gleann-na-nGealt. Tom Batt O Connor oldest resident of the valley says that people came to the Glen by instinct. Many tales abound of people coming raving mad and going away cured. 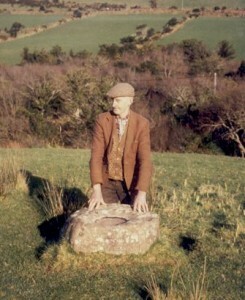 A stone near the well is called the Mad Stone, with a deep hollow in the centre of it. Legend has it that a local woman milked her cow onto the stone to provide for those who came during the night. A river crossing nearby is called Ath na Gealtan, The fools crossing. Camp is steeped in local history and there are numerous archaeological sites in the area. Local people will tell you where they are. Watch this site for more information on local history over the next few weeks.